During this Centennial year, we recognize that God has heard the millions of prayers that have been poured out to Him from our parish over the last 100 years; prayers which have been answered in so many ways. For these, we are grateful. Our greatest gift is the source and summit of our liturgy, the Eucharist, which is Jesus Himself given to us so we truly may be joined with Him to fully experience His presence and love. Each Wednesday and First Friday we come together face to face with our Lord in the peaceful beauty of our Chapel to adore our Lord Himself in the Eucharist. Each hour, faithful parishioners kneel before Jesus in the Blessed Sacrament to adore, pray and listen to our Lord speaking to their hearts. Beginning after the 8:30 a.m. Mass and ending Thursday before the 7:00 AM Mass. Beginning after the 9:15 AM Mass (8:30 AM Mass in the summer) until 5:30 PM closing prayer with Benediction. Step 1: Click here, or on the button below, to see what time slots are open. > You will be asked to enter your name, e-mail address and password. > You will be asked if you would like to receive e-mail reminders. If you select yes, you will get an automatic reminder 2 days before your scheduled adoration time. The reminder will include the time you have signed up for. What is Adoration and why is it important? Eucharistic Adoration is a form of prayer which brings us into the presence of Jesus in the Blessed Sacrament. Our Lord brings us special graces as we spend quiet time with Him. 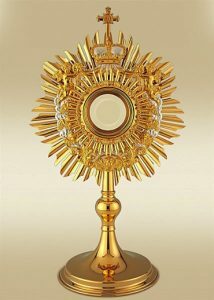 Adoration is peaceful prayer with Jesus who is visible, exposed and truly present, in the Host, in the monstrance. Adoration is a very personal prayer of thanks, worship, petition and silence. It is being with Jesus and listening to Him. It is an act of love for Him. Pope Pius X hailed perpetual Eucharistic Adoration as the devotion that surpasses all others. What do you do while you are in the Chapel during Adoration? Many stay for one hour. Some stay for a half hour, and some stay for 5 minutes. 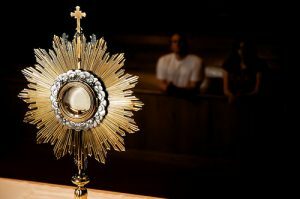 While everyone who spends time with Jesus in Eucharistic Adoration will have a unique personal experience, it is one that will always strengthen their relationship with our loving savior. What is a scheduled adorer and how do I become one? During all hours of adoration there is a need for adorers to be present with Jesus in the Blessed Sacrament. Some people are able to spend time with the Lord for the same hour each Wednesday or First Friday. These adorers have made commitments to ensure that their hour is covered each week. If a conflict should arise, they secure a substitute to fill in for them for that time frame or switch times with another scheduled adorer (asking a friend or someone on the substitute list).